Let me show you how to earn THOUSANDS of dollars monthly at top PTC site Neobux. Are you member of several PTC sites and you do not earn much? You still have not found any PTC site where you would earn as much as you imagined? Do you want to give up? No, do not give up! You can earn a lot of money at PTC sites, you just have to know how to do it! I will show you how to earn even tens of dollars a day at a PTC site. Lets use Neobux as an example. I chose Neobux mainly for the option to rent referrals. Another crucial and very important point is that Neobux has been operating since 2008, it is one of the oldest and most trusted PTC sites out there, it is proven, paying reliably all the time (and what more – instantly!). Neobux is trusted by millions of members from around the world, which makes it suitable for developing a long-term passive income. The ability to rent referrals is particularly useful for those who do not want or unable to get direct referrals. You do not need to advertise elsewhere, hunt and chase referrals to join, you can simply rent them from your earned money. You do not need to invest anything from your pocket if you do not want to, and you do not need to spend time advertising either. The best of course is getting both type of referrals, direct and rented, the more referrals you have the better, and of course the higher your daily earnings are ! The advantage of Direct Referrals is that you have them “Forever” if they remain active, and best part is that you do not need to pay anything for them on monthly basis. Your objective will be to achieve earnings of $30 – $50 per day in the shortest time possible, and without you investing anything! Of course you can earn more per day, and thanks to this guide you will know how to achieve that! The most important steps will be to achieve sufficient earnings to purchase Golden and then Ultimate membership. The final goal will be to get to 4000 rented referrals. Do not expect that you will reach your goal in one month. Be patient, this guide is not about how to get rich quick, but about creating a nice passive income over time. If you want to speed up the process you can invest here and there. This will shift you in time and your goal of earning thousands of dollars a month will be achieved much faster. (If you have been registered before and been inactive for more than a month, your account has been deleted, in this case you can choose another username and register again). Try to click on ads regularly every day. Ads can be found under View Advertisements. Select your ad, click on it, red dot will appear in the frame (or another little picture, like heart). Click on the dot, new tab will open with advertiser’s site. Keep the page open untill the yellow stripe in the O letter in the Neobux word makes it across to the end. The stripe will become green and text appears confirming you watched the ad correctly (Advertisement validated! ), with green tick and how much you earned. Then you can close the page (click on orange Close button). AdPrize is a game on similar principle as the popular AdGrid game. You do not get rewards for every click, however you can win rewards randomly, depending on your luck. You do get 3 chances for every click on paid ad you make. To have more chances for AdPrize you have to click more paid ads (unlike AdGrid where you get chances after server reset). Every AdPrize chance expires after 90 minutes. So the best tactic is to click all available normal ads and right then click all available AdPrize ads before they expire. You get following rewards for viewing each paid advertisement: money + 1 Bonus Pack = 3x AdPrize chances and 1 Point. First click all the paid ads and then start with AdPrize. Click on the blue AdPrize button at the top of the page or scroll down and click on the number in the green box. This will open a new tab with the advertiser’s site. 5s timer is running, let it run off when it turns green and you see the confirmation text with a checkmark (Advertisement Validated), click the blue Next button. This will take you straight to the next page (and you will use another AdPrize chance). Go on till you use all chances. The last page will have the Next button missing, so click on the orange Close button. You can win Points (which can be used e.g. to purchase the Golden upgrade), Golden upgrade directly (of $90 value!) and cash rewards (up to $50!). TIP: Go back to Neobux several times a day to increase earnings. Ads appear regularly throughout the day, click as much of them as possible. TIP: Install their toolbar (add-on). The link to download the toolbar can be found at the very bottom of the page on the right – the grey AdAlert button. Click on it, select your browser type. Confirmation window pops up, confirm it. Restart your browser. The add-on is the green cross icon (Neobux logo) with the red number of available ads. Now you can instantly see all the new ads, you do not miss any ad anymore! Highly recommended! New ads appear almost every 5 minutes, this way you can even double your earnings because you will be able to catch most of the ads now! To be able to rent or refer referrals you must click at least 100 ads and you must be a member for at least 15 days. Take advantage of these days mainly for learning how to use the PTC site. Get used to click regularly every day, preferably at the same hour every day. When you are a member for 15 days and you clicked at least 100 ads you can start getting referrals. Your link for getting referrals (reflink) can be found under Banners in your account. Click on your username at the top of the page to get to your account. TIP: Try to complete some paid offers to earn more money for renting referrals. You can find them under Offers -> Coins or Mini Jobs. Coins earned in Coins offers can be converted into cash. You should start with these offers as soon as possible because those rewards are only credited after 30 days. Mini Jobs are short but numerous tasks. The money is credited to your account immediately after completion. Examples of tasks: e.g. sorting Tweets to categories, sorting search terms according to relevance, searching for addresses and phone numbers and so on. Very easy! Mini Jobs will earn you far more money than anything! Mini Jobs (tasks) are in various languages (mostly in English, German or French). Read the instructions and examples carefully! You will learn a lot about what to do and how to complete the task. First you go through few test tasks. According to your results (according to how many test tasks you have filled out correctly), it will be assessed whether you are suitable for this activity. If you succeed live test begins where you earn money. If you fail you have this activity blocked forever. Therefore, you should really try to do it correctly right at the first try. If you block the activity, it is no biggie, there are plenty of other tasks you can try. You can earn a lot here – even $1 or more, depending on your mood and time. Like this you will get the money for renting referrals much faster. The key to success with Neobux and making decent money are referrals. The more referrals you have, the faster you make money. Neobux is mainly about rented referrals. 1 rented referral costs $0.20 per month. Most of the rented referrals will be active, some not. You have the option to recycle inactive referrals (recycle meaning replace the inactive referral by another rented referral) for a $0.07 fee. Recycling will unnecessarily increase your expenses so recycle carefully. You must click a certain number of ads every day (depending on your membership) to get earnings from your referrals! If you do not click the required number of ads you will NOT get referral earnings for the next day. Click all ads every day – this way you make sure you get the highest earnings and earnings from referrals too. Begin renting referrals when you reach about $3 – $3.50. Purchase a 3 referrals package for $0.60. Why do you not start renting referrals as soon as you get the $0.60 needed for buying the first package of 3 referrals? Because then you would not have enough money for extending and recycling the referrals. It will take a while but really wait until you have at least $3 in your account. Buy the referrals and you can extend them right away (the best is for 180 or 240 days as there is the highest discount). Imagine you are buying slots for referrals, not referrals themselves as they can be replaced by other referrals anytime if they are inactive. Click on your username then on the green Referrals button on the top right. Now I show you how to move $3 from Main Balance to Rental Balance. Rental Balance is used for buying and extending rented referrals. Click on Add Funds (blue plus button next to Rental Balance). Choose the amount you want to transfer/add – $3. Click on Transfer from your Main Balance button. Go to Account -> Referrals, select the 3 referrals package (not more!). You’re about to rent 3 referrals for $0.60. Are you sure? Confirm the purchase by clicking on the Yes. In your account item in menu called Rented Referrals is added. Click on the blue arrow next to it and you see the overview of your rented referrals. You can see a flag at each referral. You can click on it and mark the referral by a color, e.g. according to his activity. Green arrows are used for referral recycling. Inactive referrals are automatically recycled after 14 days of inactivity for free. Lock will lock the referral – used mainly when the referral was active a lot in past but is not active now (he’s maybe on holidays), locking him will prevent the system from recycling him automatically after 14 days of inactivity. You can rent referrals every 7 days. This option can be found at the top of your referrals list. Click on the red Disabled, it will change to green Enabled. Extending a referral for 1 month costs $0.20. There is a 15% discount when extending referrals with Autopay, so extending 1 referral via Autopay costs you only $0.17. Autopay will extend those referrals by 1 day that were active for that day. You do not need to worry about extending them as Autopay will take care of extending automatically if referrals are active and they will pay for themselves. You will earn a bit less from each referral but referrals will stay with you as long as they are active. Autopay does not work for referrals that have less than 20 days left (can differ for some Golden Pack upgrades). You have to extend these referrals manually. The first click that a referral makes in a day goes for paying for his extension by Autopay for another day. Extension by 1 day costs $0.0057, one referral click will earn you $0.005, so 1 click and something is enough to cover the cost of Autopay, the rest are your earnings + you will have the referral extended for another day. If a referral does not click you do not pay for his extension for another day (he will not be extended). Example: You rented 500 referrals, you paid $100 for renting them for a month. Instead of paying $100 for their extension next month (which is kind of big amount) you can pay for it daily with Autopay. You save 15% ($15) if you would be extending referrals via Autopay. The amount needed to extend referrals by 1 day each day will be deducted from your Rental Balance. If you do not have enough money in your Rental Balance money will be deducted from your Main Balance. If there is not enough either then nothing will be deducted. Resist the urge to withdraw money (do not request payout yet). Cashout minimum is very low – only $2 and Neobux is sending money instantly. If you still like to verify it yourself feel free to do it but only once (otherwise you would unnecessarily prolong the path to your goal). Rent another 3 referrals whenever money in your account reaches $3 – $3.50. And only 3 referrals per $3 – $3.50 reached, not more. Your money will grow much faster over time then you can rent eg. 5 referrals per $5 earned and so on. When you reach 300 referrals, stop renting additional referrals and just maintain existing ones. When the money in your account reaches $100, use $90 to purchase Golden membership. Referrals will start to earn 2x as much immediately – 100% per click instead of the original 50% per click when you were a Standard member. Your earnings from referrals will now double. Start renting referrals again and be careful to keep enough money for renewals and recycling. Once you reach 2000 referrals stop renting additional referrals and focus on maintaining them and on increasing your earned money in your account. Once you have enough money buy the Ultimate membership. Ultimate membership is expensive but has the greatest features. The best of them is the 7-day free auto recycling (if a referral is inactive for 7 days in a row the system automatically replaces him by an active referral for free). Yes, that’s right no more manual recycling referrals. You can then extend the membership for money saved on recycling! You also now have 15 guaranteed ads daily. Another great feature are endless holidays. You are receiving earnings from referrals even when you are not clicking any ads. You do not need to click ads at all! But if you are clicking you increase your earnings by your own clicks. This membership has lots of other nice features like eg. better filter for referrals (you get more active referrals), you can cash out every day, Autopay minimum is 10 days, unlimited direct referrals, more detailed statistics, and much more. Start renting referrals again until you have 4000. Then stop renting, turn Autopay off and extend referrals by 90, 150 or 240 days. The longer period, the greater the discount. Think long term. Extending by 240 days is initially more expensive but you get a 30% discount (Autopay discount is only 15%). You pay less for extending so your earnings will be much higher long term. Here you can use another feature called Autorenew – automatic extending of referrals. Turn it on (same way like Autopay). Very often Neobux has promotions like discounts on referrals extension. Make sure you take advantage of these discounts, you save really a lot. If you will be always extending only while promotion is active turn the Autorenew off as you will not need it in this case. Promotions are usually every 2 months. You can continue renting referrals over 4000 referrals using the Rental Queue but you will pay more for renting referrals (you can rent above 4000 but for a fee). Many people go over this limit because they know that it will pay off after time (initially you pay some fees but you earn much more in the end), but that is up to you. Now is also the best time for withdrawing the money because with 4000 referrals and more you earn really good money. I recommend withdrawing money not earlier than by the time you become a Golden member. Keep in mind that the sooner you get to 4000 referrals, the more money you earn in relation to time. Withdraw your money to one of the online payment processors (PayPal, Payza, NETELLER or Skrill). If you do not have one you can sign up for Paypal here or Payza here. You can receive money immediately after you sign up. – You can further increase earnings by getting direct referrals. You can get them by promoting your reflink. Direct referrals register under you for free! They will keep earning for you as long as they remain active. – It will seem it will take forever till you will be earning some good money but it is only 5 minutes of work daily! You will notice really exciting increase in amount of money earned when you start gaining referrals. – Most importantly – be patient! You will be getting a fantastic passive income every day faster than you think. – Teach your direct referrals how to earn. If referrals do not know how to earn they soon give up and you will not be earning from them. Mostly only taught referrals remain active. – Should anything be unclear or you need advice feel free to contact me, I would gladly help you! TIP: Earn money for renting referrals at Neobux at another legit paying PTC site Clixsense and speed up your way to your dream passive income! 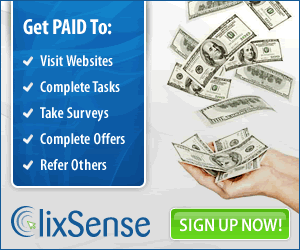 You can build a nice passive income at Clixsense too (stable, trusted PTC site with millions of members, paying since 2007)! Register now and make money on both sites! There are many PTC sites similar to Neobux where you can rent referrals. You can use this guide for them too. If you would like to register to more PTC sites (and thus to further increase your earnings) try PTC sites mentioned in the List of Best Paying PTC Sites. Daily updated list of best sites with payment proofs NEW! Neobux: 200+ ads, more than $1 daily only from clicking! Hottest News – Join our Facebook group Earnings PTC! GPTPlanet: Promotion! 20% discount on all upgrades! Earn Double From PTC Sites! Refback up to 250% for 80+ PTC Sites! Do you want your own PTC site?